I have the Bellen NL + EU Unlimited Package, however I am being charged extra because I called to UK. Furthermore, I also see on my Vebuirkstatus that I still have the Bellen 120 min naar de EU package which was replaced by the Bellen NL + EU Unlimited Package. I don't understand why I am being extra charge when I have the unlimited bundle. Would you explain me? That's a good question and I'm going to give you more information. Your contract consists of a Stel Samen & Stel Bij subscription with 3 GB of internet and you can call Unlimited within the Netherlands and the EU (including the UK). 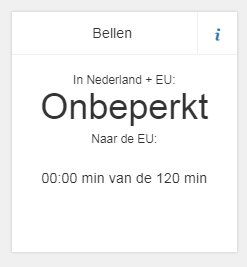 That means that in the Netherlands and EU (in Nederland + EU) you have Unlimited minutes to use, but calling to the EU (naar de EU) you get 120 minutes and you have used all 120 minutes. That's also the reason you made extra costs for calling to the UK. When you look on your 'Verbruikstatus' and check out 'Bekijk specificatie' , you can immediately see the British telephone numbers that you called, with the date and also how long every phone call took place. I hope the information is sufficient for you. If you have any other questions, please feel free to ask them. We are always ready to help you! I am not really happy how this is working right now. As far as I can see T-Mobile offers three solutions when it comes to minutes and I see other customers complaining as well and having doubts about this. T-Mobile is offering: 1 - No Minutes; 2 - 120 min to call NL + EU; and 3 - Unlimited NL + EU. The fact that a customer calls from NL or other country, I don't think it really matters for the client as he/she will want the freedom to call and not worry about the minutes as it is an unlimited bundle. Besides, there is no indication or any explanation on T-Mobile about this nor any other bundle where clients can just call with unlimited minutes. I also saw other post saying that it was an error in the system and would be deleted (see here https://forum.t-mobile.nl/t-mobile-go-495/calls-of-unlimited-nl-eu-276100). Hence, please provide a proper solution for this. The post that you shared with us doesn't apply to you, because that customer has a different rateplan (subscription). With your current subscription Stel Samen & Stel Bij you can call unlimited within the EU due to the roam like home regulations. However roam like home doesn't apply in the Netherlands therefore you have 120 minutes to call from NL to EU/UK. If the 120 minutes are used you will be charged for the calls. This is the current regulation and it's not an error in our system. You can find more information about the EU roaming regulation on this page. I hope I have provided you with sufficient information.